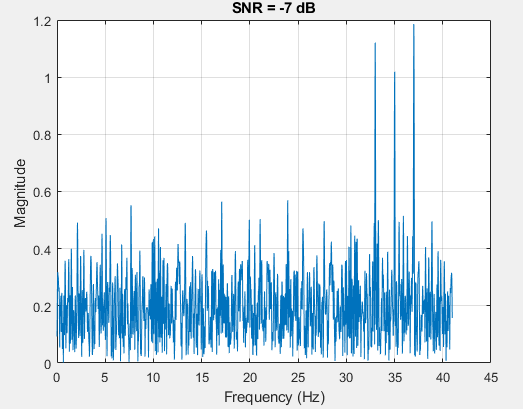 I have a noisy signal (Gaussian Noise) with a known SNR and known Noise variance. This signal contains a number of Frequency components. My ultimate objective is to detect the components of the signal. What is the Threshold formula should I use to detect the peaks of the signal in frequency domain given a certain Pfa (probability of false alarm)? This is a pretty common problem in radar signal processing. Typically, we’ll use what’s called a CFAR detector (constant false alarm rate). This essentially boils down to a non-linear smoothing filter where to attempt to estimate the local average power of the signal (excluding the current cell under test (CUT)). Afterwards, a “bias factor” is applied; this is typically determined a priori. Anything above the CFAR level + bias factor is labeled as a detection, and everything else is ignored. I’m sure there is a wealth of publicly available information on the topic, and I’d highly recommend doing some googling, or even looking around more on this website. EDIT: Neyman-Pearson is indeed the standard technique. There are loads of papers about this topic on IEEE Xplore, I highly recommend you check them out. That "bias factor" I talked about earlier is the thing you'll want to calculate based on your PFA or PD curve, which is a function of SNR. Not the answer you're looking for? Browse other questions tagged matlab fft signal-analysis peak-detection thresholding or ask your own question.